A Warm Welcome to CCR! 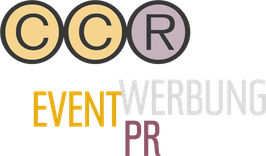 - ccr-werbeagenturs Webseite! A Warm Welcome to CCR! A keynote of our philosophy right at the start - we love our work! Nothing is more inspiring than embarking on an exciting new project. With passion, understanding, reliability and love of detail we make your event an individual and indeed unique experience. Take a look at our portfolio and let us find a solution for you and your company that is tailored precisely to your requirements.